Liverpool maintained the pressure on champions Manchester City with a dramatic last-minute goal to see off the challenge of Tottenham on a tense Sunday afternoon at Anfield. All looked to be going to plan for Jurgen Klopp and his team when Andy Robertson crossed for Roberto Firmino to head home the opener on 16 minutes. With the Spurs back five struggling to come to terms with the freedom allowed the Reds’ full-backs, Mauricio Pochettino – serving the second of a two-game touchline ban – shifted to a 4-4-2 for a second half Spurs dominated. They were worth their equaliser, scored by Lucas Moura with 20 minutes remaining, and should have secured all three points when Moussa Sissoko went clean through late on. The Frenchman blasted his shot over the bar, however, and Spurs were punished when Sissoko’s international teammate Hugo Lloris fumbled a Mo Salah header into Toby Alderweireld with full-time imminent. The resulting own goal saw the Reds go two points clear of Manchester City, having played a game more, while Tottenham are without a win in five league games and facing a battle royale to secure a top-four spot. Jurgen Klopp set Liverpool up in their familiar 4-3-3 formation, with Jordan Henderson sitting behind James Milner and Georginio Wijnaldum in midfield, with Sadio Mane, Mo Salah and Roberto Firmino comprising the usual front three. 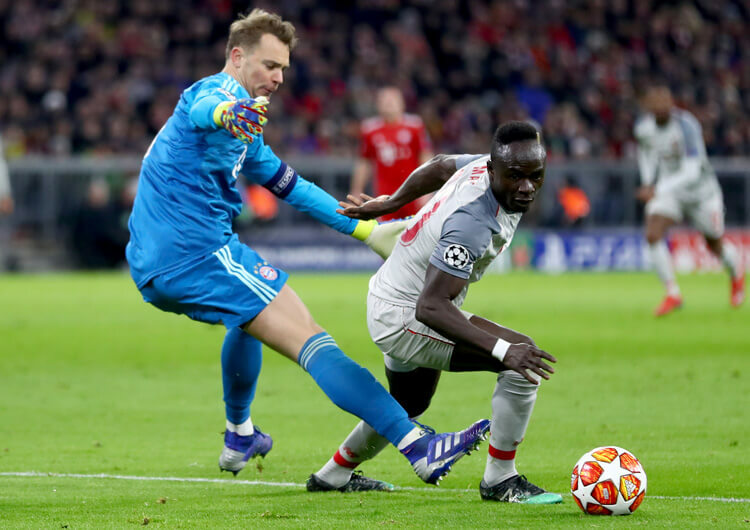 The hosts tried to release Mane and Salah into the space in behind the Tottenham defence where possible, although the Tottenham defensive line dealt with this well. 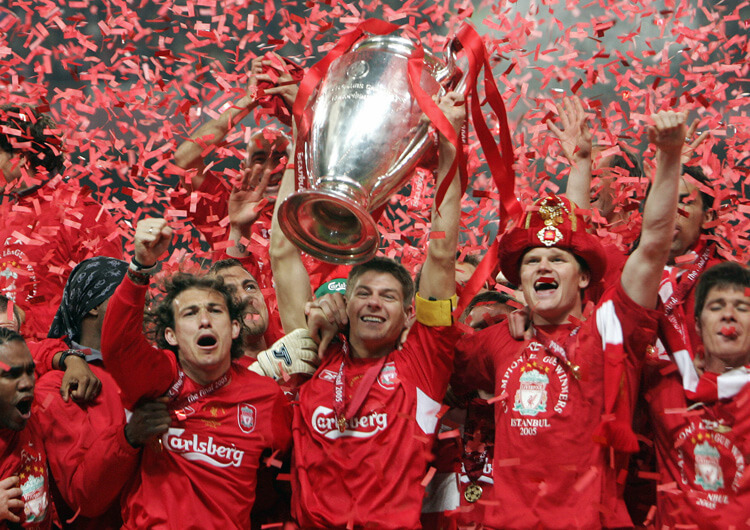 Liverpool had early struggles in their build-up, struggling to create a free man, but they managed to overcome this in two ways. 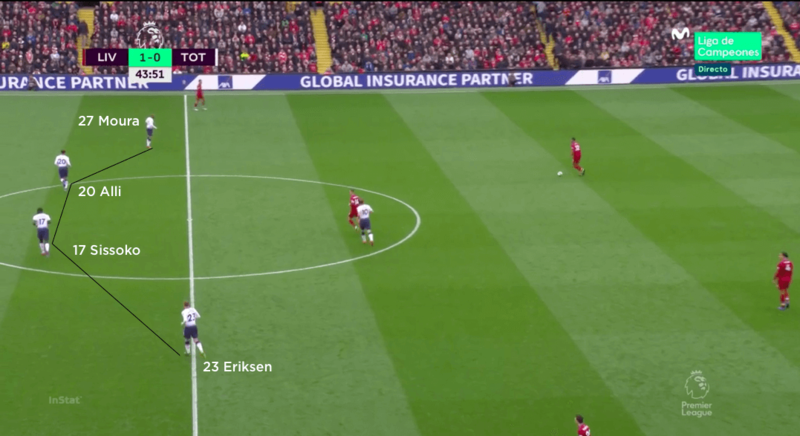 The first was to drop Wijnaldum or Milner closer to the ball in deeper areas; as Dele Alli and Christian Eriksen were tasked with pressing the Liverpool full-backs, this essentially created a two-on-one, as the combination was too far up the pitch for Kieran Trippier or Danny Rose to help. It was from such a combination that Andy Robertson was free to cross for Firmino to head the opening goal for the home side. 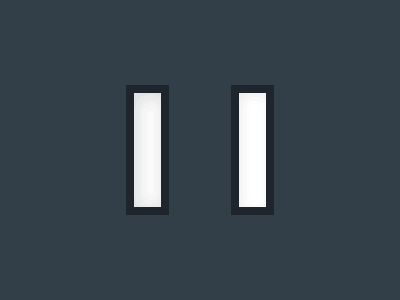 Liverpool also looked to regular switches of play. 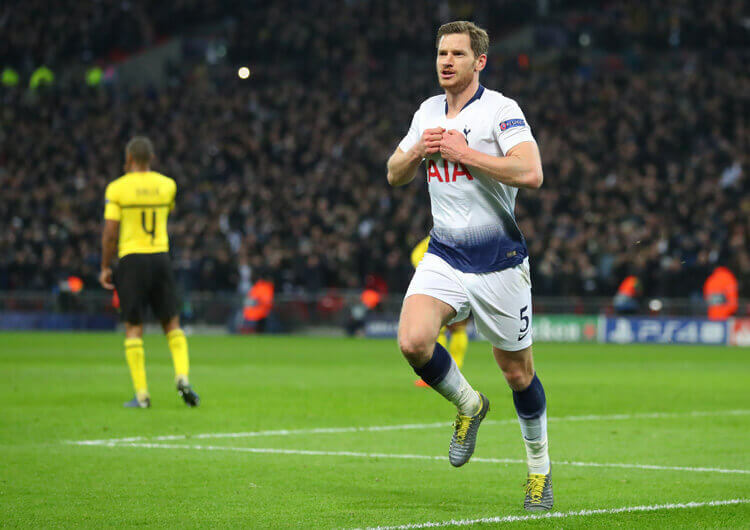 As Tottenham operated with a midfield three and tasked the outside central midfielders with pressing in wide areas, the midfield line didn’t cover a great degree of width across the pitch – this was the trade-off of remaining compact. As a result of this, Liverpool were able to hit diagonal switches to their full-backs on the far side and continue the attack from there. In the second half, after Spurs had equalised, Liverpool switched to a 4-2-4 shape – substitute Fabinho and Wijnaldum were the two central midfielders, with Mane, Firmino and Salah now joined by Divock Origi, who attacked from wide on the left. Having four points of attack naturally high up the pitch provided good coverage across the pitch without the need to push the full-backs high. This allowed Liverpool to try and exploit these areas earlier, and led to the corner from which they eventually scored their dramatically late winning goal. Out of possession, the Reds pressed in the same 4-3-3 formation they used in possession. Initially, they went man for man on the first and second lines; Mane, Salah and Firmino took responsibility for their direct opponents in the Tottenham back three, while Henderson, Wijnaldum and Milner would track Eriksen, Alli and Moussa Sissoko. 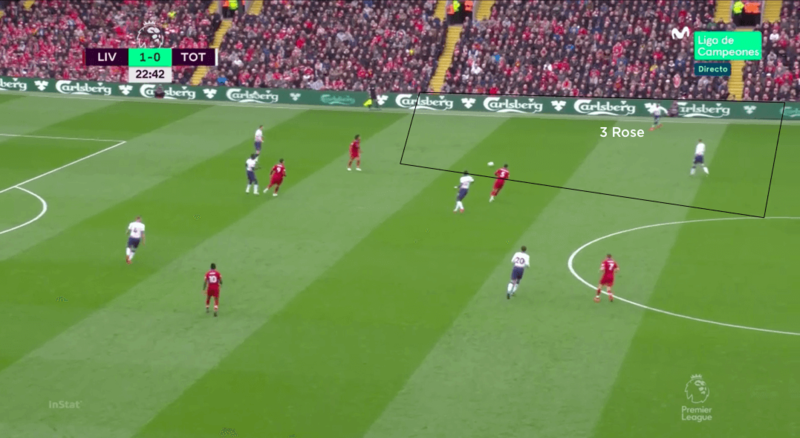 Mane and Salah would try to block off the line into the Spurs wing-backs, but this opened up a passing lane into midfield from where the visitors could still look to play to Trippier or Rose. As a result, Liverpool tried to be aggressive with their pressure to make life difficult for the Tottenham back line in possession. This included Firmino, who forced Hugo Lloris into several long balls the Liverpool defence could deal with. 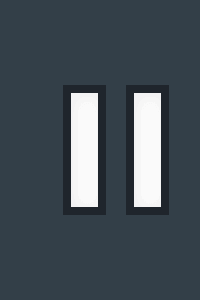 When Tottenham switched to a 4-4-2 for the second half, Salah and Mane pressed the full-backs, leaving Firmino in a one-versus-two against the Tottenham centre-backs. This gave the visitors more time to bring the ball out cleanly, which meant the Liverpool midfield had to find the balance between tracking any dropping movements of the Spurs midfielders, picking up Lucas Moura, who would drop in to find space between the Liverpool lines, and moving across to cover the full-backs if they had moved out to press Tottenham’s wide midfielders. 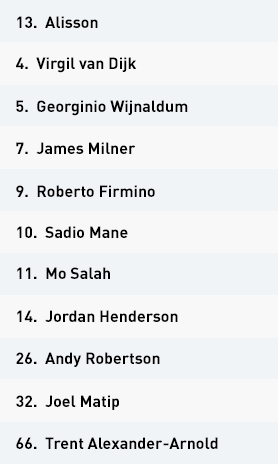 Liverpool set up in a 4-3-3 formation, with Jordan Henderson, James Milner and Georginio Wijnaldum as a midfield three behind the familiar front line of Sadio Mane, Mo Salah and Roberto Firmino. The Reds utilised the same 4-3-3 shape out of possession, with the front three going for man for man against the Tottenham back three. 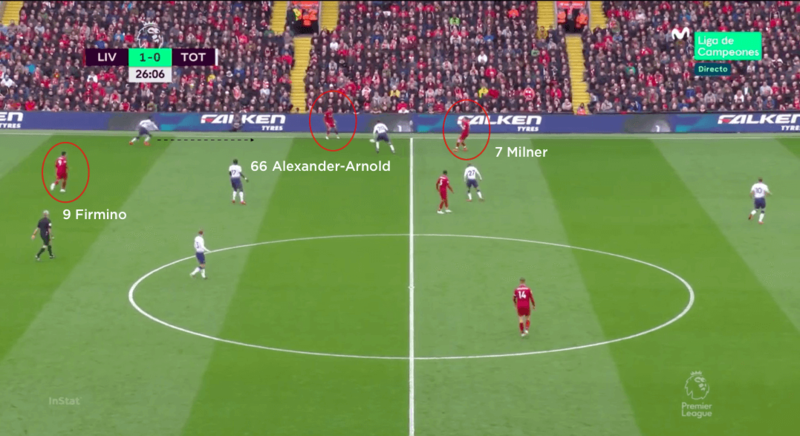 Tottenham’s outside central midfielders were tasked with tracking the Liverpool full-backs, but their lack of coverage across the pitch allowed the hosts to use regular switches to find Trent Alexander-Arnold and in this case Andy Robertson in space. The hosts also dropped their midfielders in to enable their full-backs to advance. 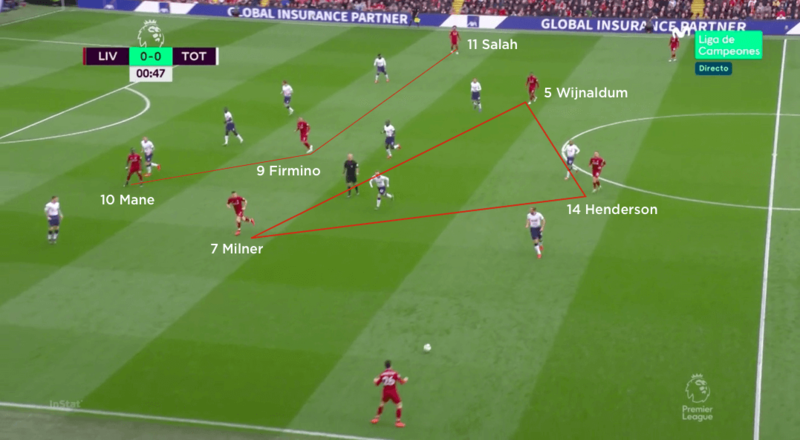 This drew the Tottenham wing-backs out, which allowed the Liverpool front three – in particular Firmino, who likes to drop – more space against the Spurs back line. Tottenham set up in a 3-5-2 formation in possession, with Lucas Moura joining Harry Kane on the top line. Wing-backs Kieran Trippier and Danny Rose provided attacking width, while Christian Eriksen and Dele Alli played in advance of Moussa Sissoko in the middle. The visitors dropped into a compact 5-3-2 off the ball. The wing-backs retreated alongside the back three, leaving Eriksen and Alli to track the dangerous Liverpool full-backs. 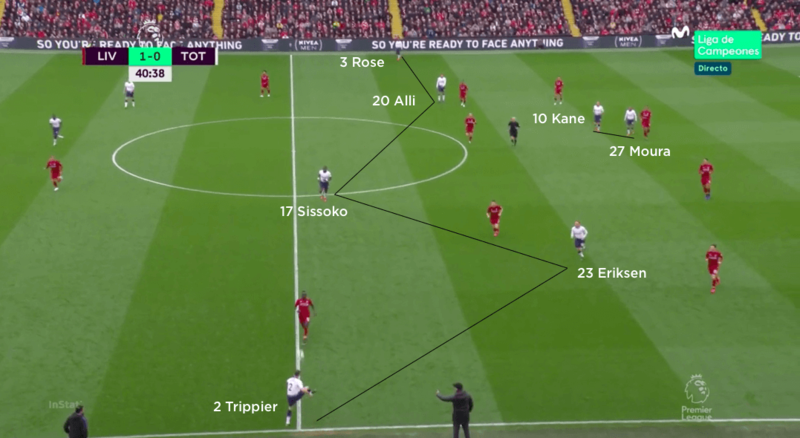 As Liverpool went man for man against the Tottenham back three and midfield three, Trippier and Rose were their most common outlets in possession. 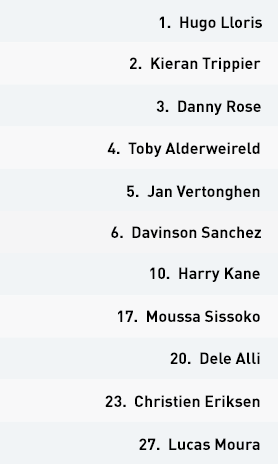 Late in the first half, Spurs shifted to a 5-4-1 shape in defence. 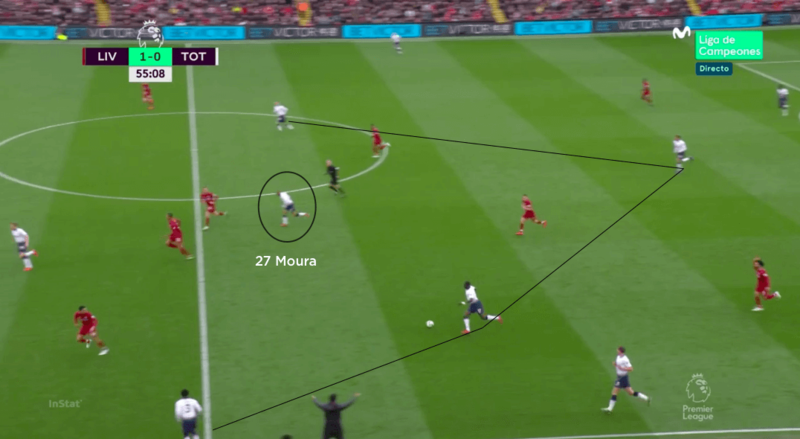 Moura dropped on to the left side of a midfield four, in a bid to reduce the freedom enjoyed by the Liverpool full-backs. Tottenham changed to a 4-4-2 formation for the second half, although in the build Moura often dropped into midfield so the visitors weren’t underloaded against the Reds’ midfield three. Mauricio Pochettino set Tottenham up in a 3-5-2 formation in possession, with wing-backs Kieran Trippier and Danny Rose providing width outside Christian Eriksen, Moussa Sissoko and Dele Alli. Lucas Moura partnered Harry Kane up front. The visitors played several direct passes in the early stages, to try and find Kane and Moura in behind, but these were comfortably dealt with by Virgil van Dijk and Joel Matip. 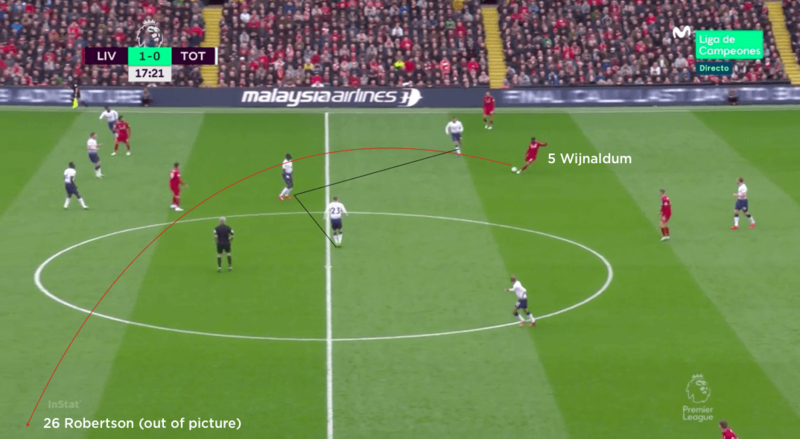 The aim was likely to push the Liverpool line back and enable Spurs to build up from deep, but this didn’t happen and they instead had to try and play out against the Reds’ high press. In this respect, they tried to use their wing-backs as their outlet, and would use the dropping movements of their midfielders, who usually received under pressure, to play out to them. In the second half, Spurs switched to a 4-4-2, with Rose in left midfield, Eriksen on the right and Jan Vertonghen shifting across to left-back from his previous position as the left-sided centre-back of three. To avoid being underloaded in midfield, Moura would often drop in, effectively creating a 4-5-1. Spurs then tried to use the ball on one side of the field with their wide midfielder, nearest central midfielder and Moura, while positioning the second central midfielder higher up in the half-space on the other side. 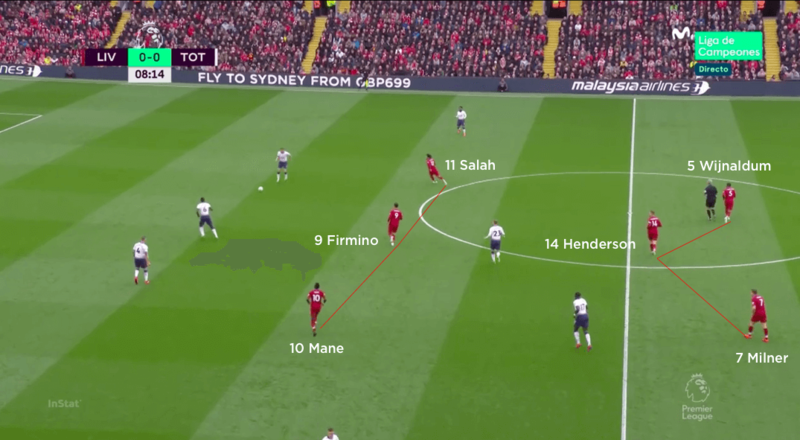 This allowed them to play around Liverpool’s midfield three, and into a teammate on the other side – which would in turn trigger forward runs from the full-backs and other midfielders. The 4-4-2 also allowed Vertonghen, who reverted to centre-back when Son Heung-min replaced Davinson Sanchez, and Alderweireld to bring the ball out more calmly, as they now only had Roberto Firmino pressing them. This created more time, but also more space for them to play into midfield and build more effectively than they had in the first half. Out of possession, Tottenham operated in a 5-3-2 formation, with Trippier and Rose dropping in to form the defensive line of five. 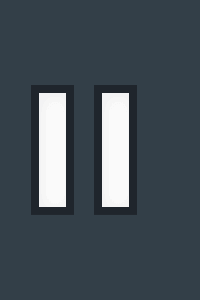 When pressing high, Kane and Moura would close down van Dijk and Matip, while Alli or Eriksen would release themselves from the midfield line of three to press the Liverpool full-back on their side. Trippier would then push up to close down James Milner, while Alderweireld, Sanchez, Vertonghen and Rose tucked in to create a line of four and restrict the space for Mane to receive in Trippier’s absence. 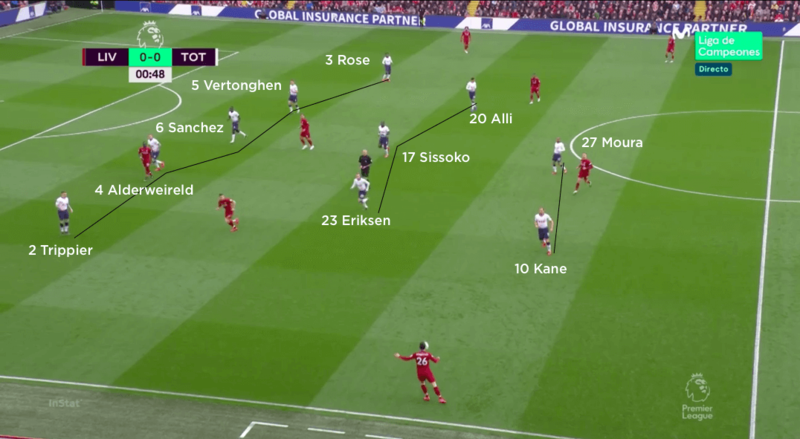 By using the outside central midfielders to press the Liverpool full-backs, Spurs were able to apply earlier pressure than if they sent Trippier or Rose up from the defensive line – which would also have provided more space for Mane and Salah against the back three. That said, it was the freedom enjoyed by left-back Andy Robertson in advanced areas that led to the hosts’ opener on 16 minutes. The visitors adjusted to a 5-4-1 shape out of possession towards the end of the first half, which gave them more coverage and nullified the threat posed by Liverpool’s full-backs and switches of play. In the second half, the 4-4-2 provided the same coverage, with the wide midfielders now pressing the Liverpool full-backs. The danger here was in the potential three-on-two overload for Liverpool in central areas, but this was reduced when Liverpool themselves moved to a 4-2-4 when chasing the game late on.  Pochettino will have been disappointed that his team couldn’t hold on for the point, having had chances – most notably for Moussa Sissoko – to earn themselves even more on the counter-attack.